Sunflowers to Cacti: Labor Day~ of Isaac that is! Labor Day~ of Isaac that is! So, the labor story- not because any of you are interested in the details, but because this is where I log events I don't want to forget!! 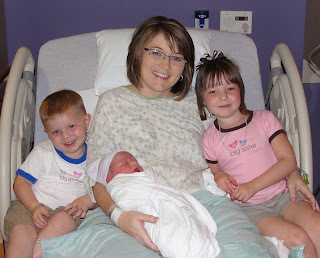 We were scheduled to be induced at the Wesley Birth Care center at 7 a.m. on the 12th. As we pull in the parking lot, 15 minutes late, I see my 2 gal friends Audra and Shonda already there waiting on us! They had come wanting to pray with us before the eventful day. I was so relieved. I had struggled with lots of emotion the night before. Dropping off the other kids and just in sheer amazement that the 9 months were over. Many days and moments of the pregnancy weren't spent how I had hoped. Due to business and living life as a mundane day by day Matt and I had kinda grown apart. Not like marital doom, but living more as roommates and connecting little on what all was happening and about to change in our life. We go check in while Audra and Shonda wait. Eventually they are allowed back. Starting the day with Audra and Shonda really helped me focus on what was about to happen. The miracle that had been developing for 9 months. Before they could even come back into my room that morning I was already in tears over if what I was doing was right. The nurse, charge nurse and Dr all tried to check me to only find me still at 2cm *to be generous said the nurse* (which I had been since 36 weeks!) and very, very high. Dr. had wanted to break my water, but with my current state she opted not. They could determine the baby was head down, so that was good. This all really challenged if I had made the right decision to be induced. With Aidan when I arrived to be induced I was already a 4, so from the get go I knew this was going to be a longer day. I settled in hooked up to the pit, covered in prayer and now time to wait. It was about 9-10 am when I started noticing a good pattern of contractions. Not painful. Strong menstrual cramps. Could still talk, move, etc through them. We got up and walked the halls a bit but funny enough my contractions stopped while I was up moving!?!? Lunch came and went without the baby I had planned. Matt made a few calls about 12:30 to let folks know it was taking longer than we'd hoped. At 1:30 the nurse paged the resident to come check me, but she was in a surgery so it would be about an hour before she could come. We had our first visitors at about 2...my "2nd" parents Jack and Joyce. They have been with a family member hospitalized next door at the hospital. Had a short visit and it was when they left I went to roll to my other side and I felt a trickle. My water??? A slight leak we discover. It was about 2:40 when the resident showed up. She checked me and asked "What have they been saying you're at today?" To which I reply "What do you think I am??" She smiled & wouldn't answer. So, I tell her I had been a 2 all day and for the past month for that matter. "Oh, you're at 4!" She seemed excited about this. I was not. All day and FOUR? She precedes to break my water at a bit after 3 p.m. Still stating the baby was high, but this would help get things going. Well within about 5 contractions I realize things just jumped into super sonic fast mode. The contractions were almost instantly 2 minutes apart and STRONG. It all happened so quickly that my breathing was less than good. So the hyperventilating that happened with Aidan's labor AND the nausea/vomiting that happened with Emma's labor all started. Contraction. Numb body from hyperventilating. Sick. Time for another contraction. No break for me to calm down. They start mentioning Epidural, which they had mentioned earlier in the day. But I just felt they were pushing it to quick and I did NOT want things to slow down. It was already 3 pm and I was worried it would be to late in the evening as is and I would not have my Dr. there. But, then after about 2 more contractions and everyone telling me to slow down my breathing I told them I was going to need something to give me a "break". So I insist the resident check me again before they administer the epidural to make sure these massive contractions had done something!! She checks...a 5. WHAT???!!! I shouldn't need meds at a 5! Didn't w/ the other 2 kids! But with more convincing & worry for the baby w/ my poor breathing I cave. They all joke "I should go ahead & get it to get my $$ worth". At 3:50 the anesthesiologist comes in as I'm saying...."O NO! Something is happening" The nurse says oh my don't push! The anesthesiologist say "Oh my do we have time?" By this time I'm begging for something- anything, assuming that at a 5 I still had lots of time and pain ahead of me. I hear one nurse behind me say "Honey why did you wait so long to get meds?" Excuse me?! Too LONG? This all "started" at a bit after 3 and it was only 3:30-3:45 at that point!! Heck she had checked me and I was only a 5 right before anesthesia walked in. Believe me if I had known I was going to go from 5 to complete in 10-15 min. I might have done several things different!! At 4 pm they're rolling me over & can now see it's time! I was still feeling some pain, but better able to breath. Feeling a bit better and knowing the photo op that was coming I insist Matt brush my sweat plastered hair off my brow & face. Which made several in the room chuckle. We announce to the room full of staff that we need a girls name. A nurse had taken a poll of other nurses earlier in the day and Ellie was beating Amilya. With the additional votes of Dr. Lowden & the resident (along with Matt & I's vote) Ellie was the winner at about 4:05. Just in time for 3 pushes and...at 4:08...IT'S A BOY!! A peeing boy! He peed on me and in Dr. Lowden's face!! What a surprise! Isaac Wayne Stout 9 lbs 11oz!! 21 in. long. With brown hair!! So there it is the labor story that placed yet another perfect angel in our arms. I will forever feel blessed that Matt and I one- are easily able to conceive, two- have very uneventful and complication free pregnancies, and equally uneventful smooth deliveries that have given us 3 perfectly healthy babies! The day concluded by the visit of a very proud big sister and brother. When Emma entered the room we inform her it's a boy and she is our only princess. Not sure of how her response would be. Her instant response was "Oh, good. Now I have a prince and a guardsman.". Oh, Emma! She was instantly ready to hold and kiss on Isaac. Aidan was more interested in the McDonalds they brought to eat and climbing all over mommy. Matt's parents brought them to visit us and kept them for a couple nights. Chris, Mandy, Libby, Shelly along with Alex & Dylan, and the Kooser family all were our first night visitors. What a first night that would end up being...for a future blog!